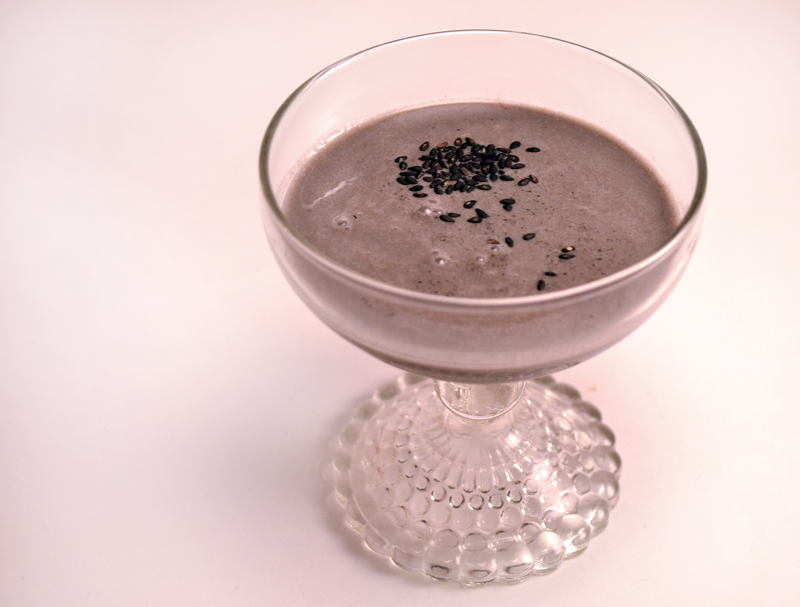 Kurogoma is the Japanese word for “black sesame”, and indeed, this drink’s most distinct flavor comes from a paste of black sesame seeds. It is unctuous, and tastes like tahini, or peanut butter, or something in between. Its color is an inky black, darker even than molasses. I knew I wanted to use whiskey for this drink, and I’ve been very satisfied to mix drinks with a bottle of Auchentoshan 10 year, lately. It is an affordable scotch with a light, assertive peatiness and a minimal amount of smoke. Trader Joe’s in Seattle carries it for a little under thirty dollars. From Scotch and sesame, it occurred to me that Drambuie would fit very nicely between them, as it matches whiskey for whiskey and honey for sesame. Break up the sesame paste in the drink with your barspoon. Dry shake, and then shake over ice. Double strain into a coupe glass and float sesame seeds of various colors on top. The flavor was good, if a little unusual to the western palate. It reminded me of Scotchy honey-nut cheerios. I slightly regret that added the half and half, as it dulled the flavor of the Drambuie, and disrupted the dark color. When I iterate on this, I will dial up the liqueur and remove the dairy. I also think the drink would be more interesting and coherent if the base spirit were a Japanese whiskey such as the Yamazaki. Break up the sesame paste in the drink with your barspoon. Shake over ice and double strain into a coupe glass. Garnish TBD. Categories: modern drinks, original creations | Tags: alcohol, bartending, booze, cocktail, cocktails, craft cocktails, cream, Drambuie, drinking, drinks, half and half, honey, japanese, kurogoma, liqueur, liquor, mixed drinks, mixology, scotch, sesame, whiskey | Permalink. I LOVE the color. I’ve been trying to create black drinks forever. I’ll have to give this a try if I can find the kurogama spread.